Queen Creek Computer Repair Service has been providing mobile computer repair services to Queen Creek, AZ since 1999. Virus removal, data recovery, small business computer consulting and remote computer repair are our specialties. Mobile computer repair means we come to you to resolve all your computer problems. Call us if you need same day virus removal, computer consulting for small business, hard drive data recovery or mobile computer repair in Queen Creek, AZ. Do you need a Queen Creek computer repair or computer service company? "William is a great tech. It was nice working with him. He is very helpful and has our best interest in mind." "Chris did a great job. He was polite and worked steadily untill the job was completed." "We had an excellent experience with Matt, who came to clean our computers. Matt found a trojan buried in our computer. He was able to effectively remove all problems and we are confident that our troubles are behind us. We couldn't be more pleased, thank you." "David was great to work with. He coached me on the regular maintenance that I should be doing. Thanks for your quick response to my request for help." "Rod explained everything he fixed as he repaired it. He did a good job." Who is Queen Creek Computer Repair Service of Queen Creek, AZ? 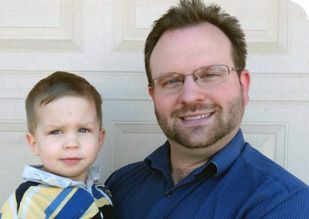 Queen Creek Computer Repair Service is owned by Matt Karls, an Electrical Engineer and a Computer Systems Engineer. We are a family owned and run computer repair company focused on service and quality, all our work is guaranteed. If you need computer repair, computer service or have any technology problem in Queen Creek, AZ we can fix it. We have been performing computer repair in Queen Creek full time since 1999. Feel free to give us a call at (480) 666-5832. Queen Creek Computer Repair Service has serviced Queen Creek and the entire Phoenix metro area for over a decade. Recently we have decided to focus on the East Valley to better serve our clients. 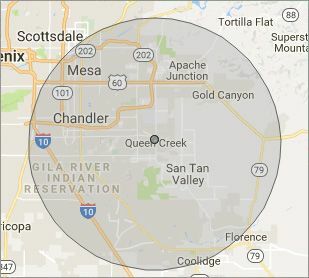 Our primary on-site computer repair service area includes Queen Creek and most of the East Valley of the Phoenix metropolitan area. We also provide on-site computer repair to San Tan Valley, Gilbert, Chandler, Mesa, Apache Junction, Sun Lakes and Tempe. Our mission is to fully resolve your computer problems quickly and affordably. If you want a Computer Engineer that can fix all of your computer repair and computer service problems instead of a computer technician, a computer geek, a computer guy or a tech that can only fix some of your computer problems; call us at (480) 666-5832. What types of Computer Repair Services do you perform? We are your computer repair specialists in Queen Creek, AZ. "Matt did such a great job, I needed a person right away and he came out same day. He was very nice and fixed my virus infection." "The reason I selected this firm was that they come to you and fix the problem in your home. Matt, the owner, called me back within an hour of requesting service and he gave up his evening to help fix my problem. We thought we cleared it all up, but it was a really nasty infection and it came back. It had infected my network and was hiding on computers on the system. Matt came back and this time was able to clean up the problem. He even took care of a few network bugs I had since he was here. Oh....I had to force him to take payment for the return service. How is that for quality of work. He is also a blast to talk to." "Matt is the small business man you want to support. He is very nice, gives out his cell phone number and calls you back." "William did a great job, at under the price that was quoted to me. He got everything working quickly and I will use them in the future."